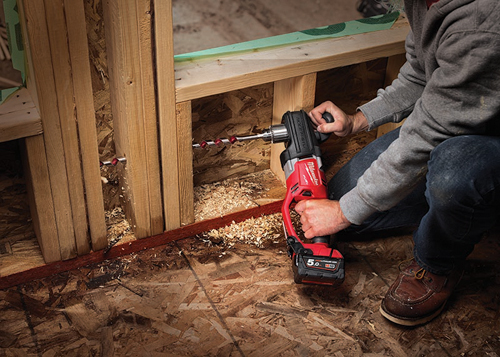 Milwaukee Power Tools have just released their new cordless M18 FUEL ™ HOLE HAWG ® 13mm Right Angle Drill, and it’s a ripper. Delivering game-changing productivity for professionals, this new and improved edition can deliver over 150x 22mm diameter holes per charge and peaks at 1,200 rpm – significantly faster than its predecessor. As an M18 FUEL ™ product, the new HOLE HAWG ® has been engineered for the most demanding applications. Delivering exceptional performance, M18 FUEL ™ products feature three exclusive innovations to Milwaukee that simultaneously deliver superior performance, durability and run-time. POWERSTATE ™ Brushless Motor supplies constant power output for faster cuts, runs cooler reducing heat for extended life, and has no wearable components. REDLITHIUM ™ Battery Pack Technology provides superior pack construction, more work per charge and more work over the life of the pack than competitive batteries. These batteries are also available with an enormous 5.0Ah capacity. 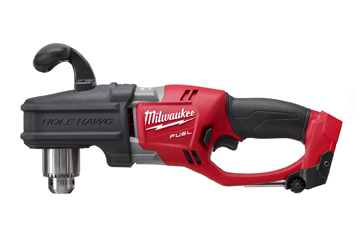 Available now, the new M18 FUEL ™ HOLE HAWG ® is a true testament to Milwaukee’s focus on the professional user and their investment in game-changing technology. Sold as a tool only (excluding batteries and charger), the M18CRAD-0 M18 FUEL ™ HOLE HAWG ® retails for RRP $299. For more information on the latest M18 FUEL ™ products, please visit the dedicated Milwaukee product page by clicking here. For more information on the full line of Milwaukee power tools and accessories you can call 1300 MILWAUKEE (645 928) or visit their website.